In the early 1880s, University Vice President Rev. John Zahm and his brother Albert took excursions to the West, Southwest, and Mexico in scientific pursuits, of archeology, geology, and anthropology. In addition to making observations, they were actively acquiring specimens to replace those destroyed in the 1879 fire. Along the way, they made many friends and realized they had also found many new recruits of students to attend Notre Dame. As Notre Dame’s enrollment exploded in the late 19th century, more and more students were arriving from outside of the Midwest. 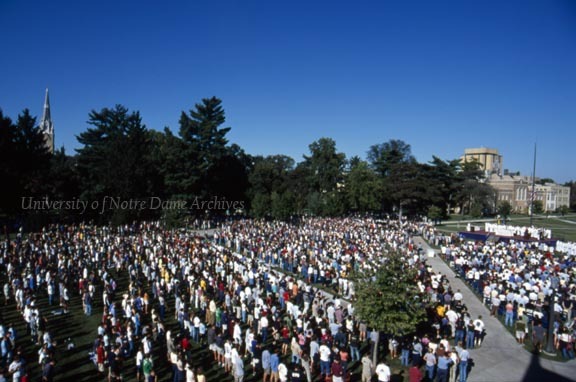 As travel from the West and Southwest was far more difficult to navigate from the East, Notre Dame helped the western students out with travel special arrangements. Fr. 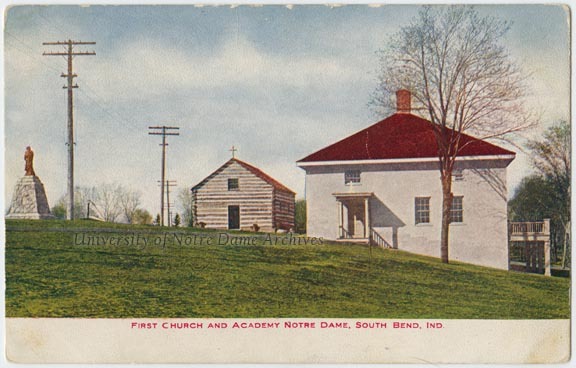 Zahm played chaperone to the Notre Dame and Saint Mary’s students hailing from these distant points in the 1880s. Zahm arranged for special train cars from points such as Denver and Chihuahua, Mexico, to travel eastward to Notre Dame. In 1883, the trip from Denver took at three days, five from Chihuahua. Train car built by the Worcester Excursion Car Company for use by western students traveling to and from campus. Many of the western students’ parents couldn’t afford to also make the trip, so Fr. Zahm and other officials acted in loco parentis, a role Notre Dame faculty and administrators always played. The special cars allowed for the students to make the trip without changing cars. Otherwise, it would be a daunting task to wrangle students ranging from the Minims to the Collegiate boys and their travel trunks. One student marveled, “the journey from South Bend to Denver without a single change of cars, and with all the comforts of a hotel from Chicago to Denver, without extra charge. 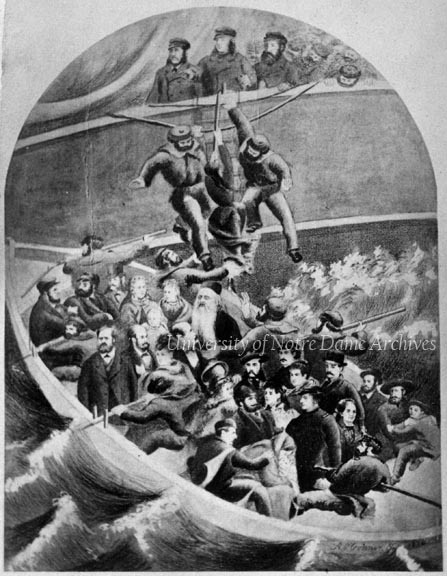 Truly, wonders will never cease!” [Scholastic, June 20, 1883]. Detail of a broadside advertisement in Spanish for prospective Notre Dame students from Mexico, featuring a map of the United States with train routes, 1883. The passengers spent much of the day fascinated by the ever-changing landscape – from mountains, to deserts, to the plains. At night, they sang songs and read stories. The students who barely knew each other before boarding became quick friends on the trip. At the stations along the way, they were greeted by alumni and friends of the University. “They came from almost every direction, — from Lander and Cheyenne on the north, in Wyoming, to Pueblo, in the South. Ouray, Telluride, Buena Vista, Crested Butte, sent their quotas to swell the throng of students, parents, and professors. People in the East have little idea of the difficulties and inconveniences that often beset the path of the Western student bound collegeward. Taking the case of Mrs. Amoretti, for instance, who with her son—now a Minim at Notre Dame—had to stage one hundred and fifty miles to Green River before striking railway travel, thence to Denver, by rail, and from there twelve hundred miles to Notre Dame!” [Scholastic, 09/22/1883, page 34]. Brothers Albert Zahm and Rev. John Zahm, CSC. The trains were decorated with banners and bunting, announcing the presence of Notre Dame students aboard and drawing the attention of onlookers. The 1883 Denver train had a special passenger in the form of a burro, brought to Notre Dame by the Scherrer boys. The burro and his bale of hay rode in the baggage car. At the same time in 1883, Fr. Zahm chartered a palace car which left from Chihuahua, Mexico, with fourteen students. 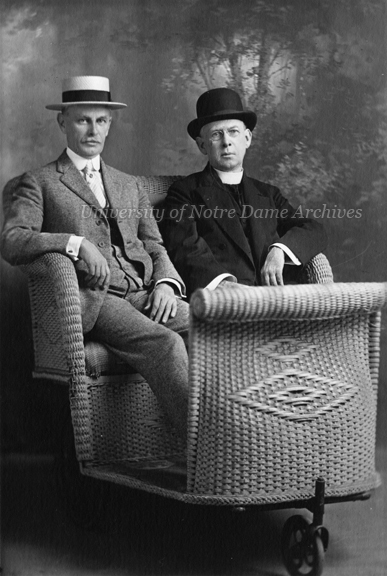 They were chaperoned by Albert Zahm and A. O’Reilly, a Notre Dame alum who worked for the Hannibal and St. Joe line. This private car allowed for the students to travel nearly 2000 miles without changing cars. Fr. Zahm, who accompanied the Denver car, kept in contact with the Chihuahua car via telegraph, monitoring its movements. They picked up more students from Las Cruces and Albuquerque, New Mexico. By the time two Pullman cars met up in Galesburg, Illinois, over seventy-five students were on their way to South Bend. “Having a special through car, the party escapes all the annoyances incident to transfers from train to train and from depot to depot. And if their car be a hotel car, they can take their meals together at their leisure, and when they feel disposed to do so. They are not obliged to wait for their meals when the train is behind time, or to bolt their food as they are almost obliged to do by the customary twenty minutes’ stoppage at railway eating houses. By having a hotel car of their own, the party is practically at home, and a long journey, far from being a source of annoyance and fatigue, becomes one of pleasure and recreation” [Scholastic, 06/06/1885, page 626]. 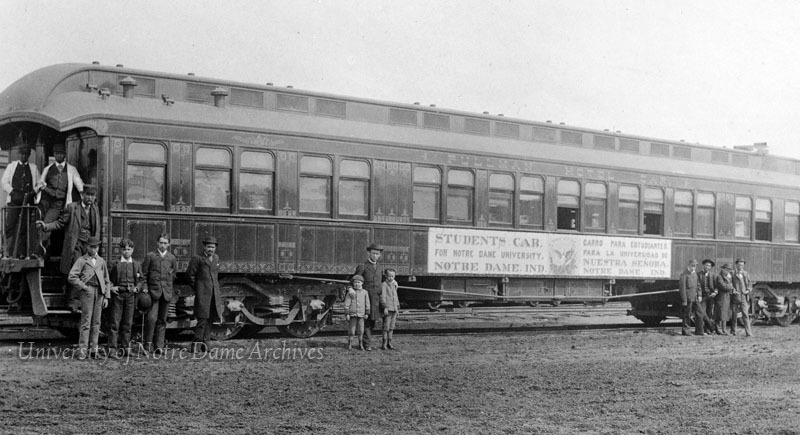 While Notre Dame continued to charter special trains for its students, many local Alumni Clubs took over arranging travel for their students into the 20th century. Rail travel eventually was bolstered by charted buses and airplanes and car pools. For Thanksgiving and Christmas vacations in 1959, students spent over $60,000 on eight charted planes and other transportation arranged by Alumni Clubs [Scholastic, 11/13/1959, page 10]. Some Alumni Clubs still help arranging mass transportation, but for the most part, students are on their own getting to and from campus.